This article is about the act of fraudulently calling emergency services to another person's address. For the killing of houseflies, see Fly-killing device § Flyswatter. An FBI SWAT team during training. In the U.S., many local police forces purchase ex-military equipment. 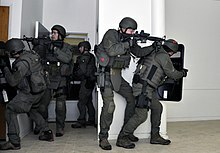 Swatting is a criminal harassment tactic of deceiving an emergency service (via such means as hoaxing an emergency services dispatcher) into sending a police and emergency service response team to another person's address. This is triggered by false reporting of a serious law enforcement emergency, such as a bomb threat, murder, hostage situation, or other alleged incident. It can also be triggered by a false report of a "mental health" emergency, such as reporting that a person is allegedly suicidal or homicidal and may or may not be armed. In the United States, the maximum prison sentence handed down by a court in March 2019 on a swatter was 20 years jail for a fatal 2017 swatting violation. The term derives from the law enforcement unit "SWAT" (special weapons and tactics), a specialized type of police unit in many countries, carrying military-style equipment such as door breaching weapons, submachine guns, automatic rifles and sniper rifles. A threat may result in the evacuations of schools and businesses. Advocates have called for swatting to be described as terrorism due to its use to intimidate and create the risk of injury or death. Making false reports to emergency services is a criminal offense in many countries, punishable by fines and imprisonment. It causes tax dollars to be wasted by the city or county when responding to a false report of a serious law enforcement emergency. In California, swatters bear the "full cost" of the response which can be up to $10,000. Swatting has origins in prank calls to emergency services. Over the years, callers used increasingly sophisticated techniques to direct response units of particular types. In particular, attempts to have SWAT teams be dispatched to particular locations spawned the term 'swatting'. The term was used by the FBI as early as 2008, and has also entered into Oxford Dictionaries Online in 2015. Swatting is linked to the action of doxing, which is obtaining and broadcasting, often via the Internet, the address and details of an individual with an intent to harass or endanger them. "Conspiracy to retaliate against a witness, victim, or informant"
"Conspiracy to commit access device fraud and unauthorized access of a protected computer"
An accomplice may be found guilty of "conspiring to obstruct justice"
A 2015 bipartisan bill in Congress sponsored by Katherine Clark and Patrick Meehan made swatting a federal crime with increased penalties. Congresswoman Clark wrote an op-ed in The Hill saying that 2.5 million cases of cyber stalking between 2010 and 2013 had only resulted in 10 cases prosecuted, although a source for this was not provided. As revenge for the bill, an anonymous caller fraudulently called police to Rep. Clark's house on January 31, 2016. On January 15, 2015, in Sentinel, Oklahoma, Washita County, dispatchers received 911 calls from someone who identified himself as Dallas Horton and told dispatchers he had placed a bomb in a local preschool. Washita County Sheriff's Deputies and Sentinel Police Chief Louis Ross made forced entry into Horton's residence. Ross, who was wearing a bulletproof vest, was shot several times by Horton. Further investigation revealed that the calls did not originate from the home and led Oklahoma State Bureau of Investigation agents to believe Horton was unaware that it was law enforcement officers making entry. James Edward Holly confessed to investigators that he made the calls with two "nonfunctioning" phones because he was angry with Horton. Ross, who was shot multiple times in the chest and arm, was injured, but was treated for his injuries and released from a local hospital. On December 28, 2017, Wichita police officers killed a man named Andrew Finch at his Kansas home in a reported swatting. Based on a series of screenshotted Twitter posts, the Wichita Eagle suggests that Finch was the unintended victim of the swatting after two Call of Duty: WWII players on the same team got into a heated argument about a $1.50 (USD) bet. On December 29, 2017, LAPD arrested 25-year-old serial-swatter Tyler Raj Barriss, known online as “SWAuTistic” and on Xbox Live as “GoredTutor36,” in connection with the incident. In 2018, Barriss was indicted by a federal grand jury along with two others involved in the incident. According to U.S. Attorney Stephen McAllister, the false hoax charge carries a maximum punishment of life in federal prison while other charges carry sentences of up to 20 years. On March 29, 2019, Barriss was sentenced to 20 years imprisonment. In 2009, a blind phreaker, Matthew Weigman, was caught with the help of a Verizon fraud-investigator named Billy Smith. Weigman was sentenced to 11 years in federal prison after he pleaded guilty to charges including "involvement in a swatting conspiracy" and attempting to retaliate against a witness. I just shot my wife, so.... I don't think I could come down there.... She's dead, now.... I'm looking at her.... I'm going to shoot someone else, soon. The incident prompted Florida's 24th congressional district Representative Sandy Adams to push for a Justice Department investigation. In 2013, a number of U.S. celebrities became the victims of swatting, including Sean Combs. In the past, there have been swatting incidents at the homes of Ashton Kutcher, Tom Cruise, Chris Brown, Miley Cyrus, Iggy Azalea, Jason Derulo, Snoop Dogg, Justin Bieber, and Clint Eastwood. In 2013, a network of fraudsters involved in carding and doxing of public officials using stolen credit reports targeted computer security expert Brian Krebs with malicious police reports. Mir Islam, the leader of the group, had also used swatting hoaxes against prosecutor Stephen P. Heymann, congressman Mike Rogers, and against a girl he was cyberstalking who turned down his romantic proposals. Islam was convicted for doxing and swatting over 50 public figures, including Michelle Obama, Robert Mueller, John Brennan as well as Krebs, and was sentenced to two years in prison. The Ukrainian computer hacker Sergey Vovnenko was convicted of trafficking in stolen credit cards, as well as planning to purchase heroin and ship it to Brian Krebs then swatting him. He was sentenced to 15 months in prison in Italy, and 41 months in prison in New Jersey. On August 27, 2014, YouTube user Jordan Mathewson, known online as Kootra, live streamed a game of Counter-Strike: Global Offensive on Twitch. A viewer called 911 claiming that there was a shooting in the building with hostages. A SWAT team raided the office out of which Mathewson's gaming company, The Creatures LLC, was operating. Mathewson was thrown to the ground and searched as officers searched the room. The events were broadcast live on the internet, until law enforcement blocked the camera lens on Mathewson's desk. Videos of the swatting went viral, gaining over four million views on YouTube and being reported on news programs all over the world. On September 11, 2014, Bukkit programmer Wesley "Wolvereness" Wolfe was the victim of a swatting incident. An unidentified Skype caller told police that Wolfe had shot his parents and was on a killing spree. Wolfe believed he was targeted in retaliation to his issuing of a DMCA takedown of CraftBukkit from the Bukkit repository. On November 6, 2014, the home of an unnamed executive with Bungie, a developer of the Halo and Destiny franchises, was raided by local police after a call, purported to be from someone inside the house, said that there was a hostage situation at the residence. The caller had demanded a ransom of $20,000 and claimed they had planted explosives in the yard. After 45 minutes, police determined the call originated from a computer and not from the residence; they further stated that the perpetrator of the hoax could face a fine and one year in jail if apprehended. On December 5, 2014, police in Coquitlam, British Columbia arrested a teenager using the pseudonym 'Obnoxious' who had committed at least 40 attempted and successful acts of swatting in several countries. The teenager historically targeted "mostly young, female gamers" that ignored friend requests in League of Legends and on Twitter. He used social engineering techniques and Skype tracking tools to obtain address details of victims from companies including Cox Communications and VoIP calling to mask his real location. He went so far as to live stream his swatting calls. The youth pleaded guilty to 23 crimes. A New York Times article on the case criticized Twitch for failing to block the user and his associates from the site. On January 3, 2015, twenty Portland, Oregon, police officers were sent to the former home of Grace Lynn, a transgender woman. She stated that this was the culmination of months of online harassment from Gamergate supporters after she withdrew her support for the movement. The swatter, coming from Serbia, claimed to be not affiliated with Gamergate. Lynn said that she was alerted to the incident because she had proactively checked for online harassment daily, and she had defused the situation by contacting police. In May 2015, Zachary Lee Morgenstern, 19, of Cypress, Texas, was arrested after he made a number of hoax bomb threats and "swatting" calls in Minnesota, Ohio, and Massachusetts, including for two schools in Marshall, Minnesota. The police obtained his IP address from Twitter and Google. Morgenstern pleaded guilty to several federal crimes, and, in December 2015, was sentenced to 41 months in prison. In August 2015, the founder of the website Mumsnet was the target of a swatting, which resulted in the deployment of a London Metropolitan Police Service armed response unit attending her home address. The hoax was concurrent with a denial-of-service attack on the Mumsnet website and threats of a swatting attack. On January 31, 2016, at around 10pm, U.S. Representative Katherine Clark was swatted by an anonymous caller who claimed there was an active shooter in the home. Melrose Police responded to the home, and left after determining the call was a hoax. Rep. Clark had sponsored a bill called the 'Interstate Swatting Hoax Act of 2015', aimed at increasing the penalties for swatting, as well as making swatting a federal crime. After the incident, she said she had been very sympathetic to people who have been the victims of swatting before Sunday night but now fully understands what it’s like. She further stated that the swatting "will really cause me to double down." On April 28, 2017, Twitch user Paul Denino (pseudonym "Ice Poseidon") was live streaming before boarding an American Airlines flight. After the plane had landed, law enforcement showed up on the airport apron and removed Denino and one other person from the plane. An anonymous caller claimed that Denino had a bomb when he did not. On October 16, 2017, Bitcoin engineer Jameson Lopp's neighborhood was locked down by law enforcement responding to a reported hostage situation. An anonymous caller claimed to have shot and killed one person while holding others hostage for ransom in a house rigged with C4. Lopp later wrote a first person account of the ordeal and offered a bounty for information leading to the arrest and conviction of the perpetrator. On May 16, 2018, popular streamer and former professional Overwatch player Felix "xQc" Lengyel had his home raided by police and was handcuffed mid-stream at his California apartment. Lengyel later revealed that three guns were pointed at him. While Overwatch League analyst Brennon Hook stated that the raid was due to a noise complaint from a neighbor, Lengyel asserted that it was an act of swatting. On June 5, 2018, police were called to the Parkland, Florida home of Stoneman Douglas High School shooting survivor and gun-control activist David Hogg. The caller claimed that there was a "hostage situtation," prompting an emergency response that included a SWAT team. Hogg was not at home at the time, as he was in Washington, D.C. with his family to receive the Robert F. Kennedy Human Rights Award as one of the organizers of the March for Our Lives. In October 2018, the Seattle Police Department (SPD) launched an opt-in registry aimed at people who fear that they might become victims of swatting, such as celebrities or live streamers. Using the registry, these people can provide cautionary information to the SPD, which will inform officers responding to potential swatting attempts targeted at the victim's address. ^ Swaine & Holpuch. "Ferguson police: a stark illustration of newly militarised US law enforcement". The Guardian. Archived from the original on October 3, 2015. Retrieved December 14, 2015. ^ Pilkington, Ed. "US police departments are increasingly militarised, finds report". The Guardian. Archived from the original on January 5, 2016. Retrieved December 14, 2015. ^ Enzweiler, Matthew James (2015). "Swatting Political Discourse: A Domestic Terrorism Threat". Notre Dame L. Rev. 90 (5). Archived from the original on September 11, 2015. Retrieved January 14, 2018. ^ Healy, Patrick. "Online Gamer Sentenced in Ventura County "Swatting" Hoax". NBC Los Angeles. Archived from the original on July 4, 2015. Retrieved July 3, 2015. ^ Mulvaney, Nicole. "Recent wave of swatting nationwide fits definition of terrorism, Princeton police chief says". NJ.com. Archived from the original on July 4, 2015. Retrieved July 3, 2015. ^ Liebl, Lance. "The dangers and ramifications of doxxing and swatting". Gamezone. Archived from the original on June 12, 2018. Retrieved July 2, 2015. ^ BOMB THREATS AND SEARCH TECHNIQUES. Bureau of Alcohol, Tobacco and Firearms. 1976. Archived from the original on January 1, 2018. Retrieved December 31, 2017. ^ BOMB THREATS AGAINST US AIRPORTS, 1974. Federal Aviation Administration. Archived from the original on December 31, 2017. Retrieved December 31, 2017 – via NCJRS.gov. ^ "One Year Later, Kim Apologizes for Bomb Threat Hoax". Harvard Crimson. Archived from the original on February 13, 2018. Retrieved December 31, 2017. ^ "FBI — Harvard Student Charged with Bomb Hoax". FBI. Archived from the original on May 29, 2016. Retrieved December 31, 2017. ^ "Bomb threats close 26 schools across UK on GCSE exam day". Archived from the original on September 9, 2017. Retrieved December 31, 2017. ^ Stewart, Will; Allen, Peter (February 17, 2016). "EXCLUSIVE The teenage computer wizard 'behind the dark web': French anti-terror police quiz 18-year-old 'hacker' after bomb hoaxers shut down schools worldwide". The Daily Mail. Archived from the original on February 13, 2016. Retrieved November 25, 2016. ^ Ax, Joseph (August 9, 2017). "Bomb threat suspect in Israel offered services on dark web: U.S. authorities". Reuters. Archived from the original on November 7, 2017. Retrieved November 6, 2017. ^ "Don't Make the Call: The New Phenomenon of 'Swatting'". Federal Bureau of Investigation. February 4, 2008. Archived from the original on May 29, 2016. Retrieved July 28, 2016. ^ "From bants to manspreading: what's new in the oxforddictionaries.com". The Guardian. August 27, 2015. Archived from the original on September 5, 2015. Retrieved August 28, 2015. ^ Prentice, George (April 13, 2013). "UPDATE: Meridian Teen Charged With Conspiracy With Australian Youth To Make Bomb Threats To Schools, Businesses | citydesk". Boiseweekly.com. Archived from the original on May 8, 2013. Retrieved September 6, 2013. ^ Bailey, Poland (2016). Haters: Harassment, Abuse, and Violence Online. Lincoln: Potomac Books. p. 55. ISBN 9781612347660. OCLC 962184824. ^ a b "Individual Pleads Guilty in Swatting Conspiracy Case". fbi.gov. January 29, 2009. Archived from the original on May 29, 2016. Retrieved July 12, 2015. ^ "Last Defendant Sentenced in Swatting Conspiracy". fbi.gov. November 16, 2009. Archived from the original on May 14, 2016. Retrieved July 12, 2015. ^ "Sen. Ted Lieu, author of anti-'swatting' bill, becomes a swatting victim". dailybreeze.com. Archived from the original on August 26, 2017. Retrieved February 7, 2015. ^ "A3877". www.njleg.state.nj.us. Archived from the original on January 2, 2018. Retrieved December 31, 2017. ^ "N.J. lawmaker who wants to combat dangerous 'swatting' prank gets swatted". Archived from the original on December 31, 2017. Retrieved December 31, 2017. ^ "Moriarty's 'swatting' bill passes Assembly Homeland Security Committee". May 11, 2015. Archived from the original on January 25, 2018. Retrieved December 31, 2017. ^ "Bipartisan Bill Aims to Combat Dangerous 'Swatting' Hoaxes". November 18, 2015. Archived from the original on December 31, 2017. Retrieved December 31, 2017. ^ "Congressperson asks DoJ to "intensify enforcement" of online harassment laws". Ars Technica. Archived from the original on September 2, 2018. Retrieved December 30, 2017. ^ "Sexism in cyberspace". TheHill. March 10, 2015. Archived from the original on August 23, 2018. Retrieved December 30, 2017. 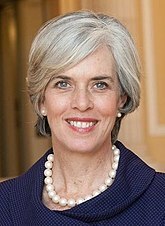 ^ a b "Police swarm Katherine Clark's home after apparent hoax – The Boston Globe". BostonGlobe.com. Archived from the original on August 6, 2018. Retrieved December 30, 2017. ^ "Court document reveals more about Sentinel, OK, bomb threat". NewsOK.com. January 22, 2015. Archived from the original on February 16, 2015. Retrieved February 16, 2015. ^ "No charges for man who shot police chief in Oklahoma". MSNBC. Archived from the original on August 6, 2018. Retrieved December 29, 2017. ^ Manna, Nicole (December 29, 2017). "Call of Duty gaming community points to 'swatting' in deadly Wichita police shooting". The Wichita Eagle. Archived from the original on July 16, 2018. Retrieved December 29, 2017. ^ Darrah, Nicole (December 29, 2017). "Kansas police investigate whether fatal shooting was result of prank called 'swatting'". Fox News. Archived from the original on March 22, 2018. Retrieved December 29, 2017. ^ Sommerfeldt, Chris (December 29, 2017). "Kansas man shot to death by police was reportedly unintended victim of 'Call of Duty' 'swatting' prank". New York Daily News. Archived from the original on December 29, 2017. Retrieved December 29, 2017. Sommerfeldt, Chris (December 29, 2017). "Kan. man killed by cops was victim of 'swatting' prank". NY Daily News. Archived from the original on December 29, 2017. Retrieved December 29, 2017. ^ "Kansas Man Killed In 'SWATting' Attack — Krebs on Security". krebsonsecurity.com. Archived from the original on August 11, 2018. Retrieved December 29, 2017. ^ Gonzales, Suzannah. "California man, two others indicted in fatal Kansas 'swatting' case". U.S. Archived from the original on July 9, 2018. Retrieved May 26, 2018. ^ CNN, Steve Almasy and Melissa Alonso. "His 'swatting' call led to the death of a man. Now he is going to prison for 20 years". CNN. Retrieved 2019-03-29. ^ Shirek, Jon. "9-1-1 hoax snares conservative blogger". WXIA-TV Atlanta, Pacific and Southern Company, Inc. Archived from the original on January 16, 2013. Retrieved June 11, 2012. ^ "PICKET: FLA Congresswoman leads 85 member effort demanding Swat-ting investigation from DOJ". Washington Times. June 10, 2012. Archived from the original on June 11, 2012. Retrieved June 11, 2012. ^ "Diddy the latest swatting prank". 3 News NZ. Archived from the original on January 2, 2014. Retrieved April 3, 2013. ^ "Serial swatter, stalker and doxer Mir Islam given 2 years prison". July 15, 2016. Archived from the original on July 15, 2018. Retrieved December 31, 2017. ^ "Hackers launch DDoS attack on security blogger's site, send SWAT team to his home". March 17, 2013. Archived from the original on July 11, 2018. Retrieved December 31, 2017. ^ "Thugs who sent Brian Krebs heroin and a SWAT team sentenced". February 21, 2017. Archived from the original on August 13, 2018. Retrieved December 31, 2017. ^ "Ukrainian hacker gets 41 months in prison for leading online theft ring". Archived from the original on July 15, 2018. Retrieved December 31, 2017. ^ "Teen Arrested for 30+ Swattings, Bomb Threats — Krebs on Security". krebsonsecurity.com. Archived from the original on August 6, 2018. Retrieved May 13, 2014. ^ "FBI — Canadian Law Enforcement Officers Arrest Canadian Resident Suspected in Series of 'Swatting' Incidents Throughout North America". Federal Bureau of Investigation. Archived from the original on March 6, 2016. Retrieved July 28, 2016. ^ Kehler, Therese (August 5, 2014). "'Swatting' leads to 60 charges against Ottawa boy". Ottawa Citizen. Archived from the original on June 5, 2018. Retrieved May 13, 2014. ^ "Another thug learns that SWATting Brian Krebs is a bad idea". September 26, 2017. Archived from the original on August 7, 2018. Retrieved December 31, 2017. ^ "Suburban Denver 'swatting' incident caught on gamer's camera". New York Daily News. August 27, 2014. Archived from the original on February 11, 2018. Retrieved August 28, 2014. ^ "'Minecraft' CraftBukkit Mod Developer Becomes Victim of Swatting". Archived from the original on March 10, 2015. Retrieved September 13, 2014. ^ "Video game developer, police run afoul of "swatting" hoax". Archived from the original on September 25, 2015. Retrieved September 13, 2014. ^ a b c Crecente, Brian (November 7, 2014). "Destiny developer startled awake by police, sheriff's helicopter after faked 911 call". polygon.com. Vox Media Group. Archived from the original on November 7, 2014. Retrieved November 7, 2014. ^ "Teen pleads guilty to 23 charges of swatting, harassing online game rivals". Ars Technica. Archived from the original on July 27, 2018. Retrieved December 30, 2017. ^ Fagone, Jason. "The Serial Swatter". New York Times. Archived from the original on November 27, 2015. Retrieved November 25, 2015. ^ "Coquitlam teen pleads guilty". Vancouver Sun. Archived from the original on December 2, 2015. Retrieved November 25, 2015. ^ "Coquitlam teenager sentenced". Vancouver Sun. Archived from the original on December 1, 2015. Retrieved November 25, 2015. ^ "Swatter meets bulldog, swatter loses". North Fulton Herald. Archived from the original on March 27, 2016. Retrieved March 18, 2016. ^ Silverstein, Jason (January 4, 2015). "'I am afraid for my safety': California woman has 20 police sent to former home in Portland as part of Gamergate harassment campaign". Daily News. New York. Archived from the original on January 30, 2018. Retrieved January 4, 2015. ^ "Gamergate: Woman blames online harassers for hoax that sent 20 Portland cops to her former home". OregonLive.com. Archived from the original on August 16, 2018. Retrieved January 4, 2015. ^ Robertson, Adi. "'About 20' police officers sent to Gamergate critic's former home after fake hostage threat". The Verge. Vox Media. Archived from the original on November 25, 2015. Retrieved November 24, 2015. ^ "Prank call sends close to 20 police officers to Southwest Portland home". OregonLive.com. Archived from the original on May 17, 2018. Retrieved January 4, 2015. ^ FBI catches swatter who said “you can’t catch a hacker Archived March 7, 2018, at the Wayback Machine, Naked Security, Sophos (August 12, 2015). ^ [Houston, Texas-Area Teenager Sentenced to More Than Three Years in Prison for Swatting and Making Bomb Threats to Minnesota High School], United States Department of Justice (December 22, 2015). ^ "Mumsnet's co-founder suffers 'swatting attack'". BBC News. Archived from the original on August 22, 2018. Retrieved June 21, 2018. ^ Erickson, Jon (April 28, 2017). "Internet personality says he was target of prank threat at Sky Harbor". KNXV. Archived from the original on July 27, 2018. Retrieved May 23, 2017. ^ Zarcone, Patrick (August 16, 2017). "Durham man says 'enemies' called 911 to report false hostage situation". CBS17. Archived from the original on August 8, 2018. Retrieved August 16, 2017. ^ Lopp, Jameson (July 28, 2018). "Reflections Upon a SWATting". Archived from the original on August 6, 2018. Retrieved July 30, 2018. ^ Kent, Mike (May 16, 2018). "Controversial Streamer xQc Swatted Mid-Broadcast in California Apartment". Archived from the original on July 8, 2018. Retrieved May 24, 2018. ^ Rabin, Charles. "Police swarm home of Parkland student activist David Hogg after 'swatting' hoax call". chicagotribune.com. Archived from the original on August 5, 2018. Retrieved June 7, 2018. ^ a b "David Hogg's Florida Home 'Swatted' by Prank Hostage Call". amp.thedailybeast.com. Retrieved June 7, 2018. ^ "Seattle police launch opt-in registry system to help prevent swatting". PC Gamer. Archived from the original on October 3, 2018. Retrieved October 2, 2018. "The Crime of 'Swatting' — Fake 9-1-1 Calls Have Real Consequences". Federal Bureau of Investigation. September 3, 2013. Wilson, Simone (November 8, 2012). "SWATting, a Deadly Political Game". LA Weekly. Sterling, Bruce (November 30, 2007). "Guilty Plea: Phone Phreaks Use Caller-ID Spoofing to Get Foes Raided By SWAT | Threat Level from Wired.com". Wired. Omega, Jan (September 8, 2014). "Teenager Receiving Life In Prison For 'SWATTING' Gamer Is A Satirical Hoax Which Stirred Social Media". Inquisitr. Klepek, Patrick (February 17, 2015). "Meet A Teenager Who Says He's A Swatter". Kotaku.